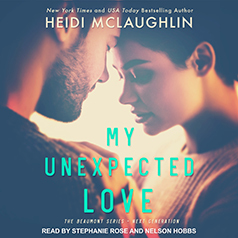 Heidi McLaughlin presents the second book in the Beaumont Series: Next Generation series. From the moment Elle James met Ben Miller they've been best friends. Everything they did, they did it together, from late night study sessions, family vacations, throwing bottles off the water tower, going to prom and finally moving to California for college. However, after the almost tragic accident where she nearly lost her twin sister, Elle's life hasn't been the same, and neither has her relationship with Ben.